One big problem with the earlier email marketing approach was irrelevant bulk emails sent by most of the marketers. Email drip campaigns seek to fix this issue by making emails more personal and relevant using smart targeting, triggering, and tracking. Another good thing about drip campaigns is that they are quite affordable and businesses of all sizes can make use of them. Also, note that drip campaigns are not just restricted to email marketing; you can use this tool for recruiting as well. A drip campaign consists of a series of emails set to be delivered automatically to targeted prospects based upon the timing and trigger actions of each user. Drip campaigns can be used to stay in touch with prospects, subscribers, or users associated with a certain event, e.g. those who perform a specific action on your website or whom you just want to reach out to and build connections with. 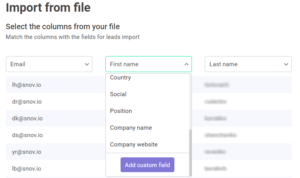 The email automation platform, Snovio, allows you to create email drip campaigns in a simple and easy manner in just a few minutes. Each email from the total queue of emails that you plan to send makes one unit of the drip campaign. You just need to set up a drip campaign once. Thereafter, it does all the work automatically on its own; the campaign automatically sends out emails based upon the user’s action (trigger), timing preferences, etc. There are four things to pay attention to when composing the first drip campaign. Each email in the series is set to be delivered at the right time. This timing is usually determined based upon a certain trigger. For example, you can set the second email to be delivered after the elapse of a certain time after the user opens the first email or clicks the link embedded in the email. Also, you can schedule the email sending so all the leads will get their emails according to the time zone they live in. Drip campaigns are often used for nurturing leads and persuading them to switch to your particular business, platform, or tool. This is done automatically by sending a series of emails to those who have just begun their journey with you, in order to make them ready for the next stage of the marketing or sales campaign. One reason why drip email is better than its predecessor, bulk email approach, is that it offers great scope for personalization of the message and email sequence in general. You need to personalize the email as much as possible, with every variable. The bare minimum of personalization should include addressing the recipients with their names, company, and designation. In a way, scheduling and triggers are a part of a personalized approach as well. This is because the second email is sent to people personally only when they perform a definite action. Automation makes the drip campaigns what they are. If you were to track each response and send each email in the series manually, you would go crazy without achieving much success. Automation platforms like Snovio let you set up and run the drip campaign on the auto mode, which reduces the chances of human error and increases the efficiency of the campaign. Email drip campaigns have almost everywhere replaced the traditional bulk email campaigns, which have already become outdated. A user-friendly automation tool like Snovio makes the drip campaigns highly efficient and affordable, bringing this powerful tool into the hands of businesses of all sizes. NEXT POST Next post: Why is hacking so common these days?